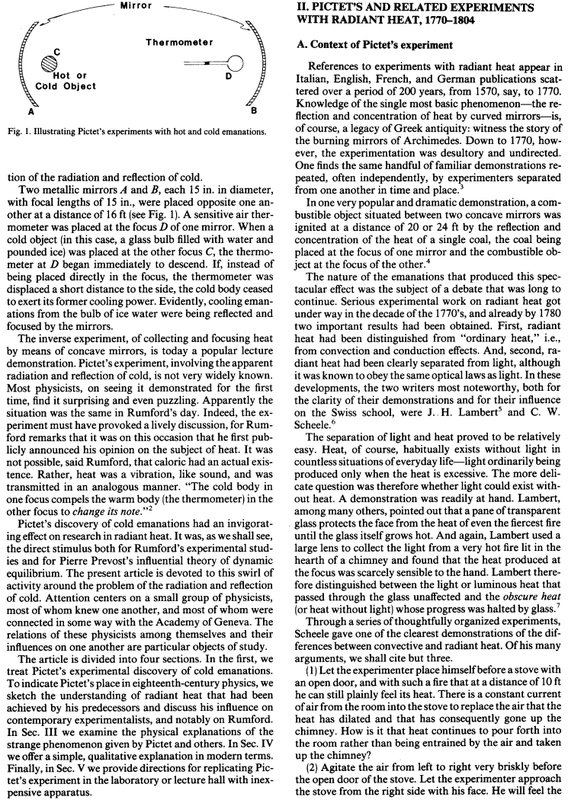 A paper published in the American Journal of Physics describes the simple experiment of Pictet in 1800, demonstrating that a cold body cannot make a hot body hotter, in fact quite the opposite. It wasn't until 51 years later in 1851 that Lord Kelvin & Clausius introduced the 2nd law of thermodynamics to explain the theory behind this phenomenon, requiring a one-way transfer of heat only from hot to cold that is necessary to maximize entropy production. Subsequently, quantum theory also explained why a lower temperature/frequency/energy body cannot increase the temperature of a higher temperature/frequency/energy body, because all of the higher frequency quantum microstates of the hotter body are already filled and cannot be raised higher by lower energy photons from the lower temperature/frequency/energy body. Although radiation between a hot and cold body is bidirectional, heat transfer is always one way only from hot to cold, as transfer of heat from cold to hot requires an impossible reduction of entropy (without work input) forbidden by the 2nd law. Two polished concave metal mirrors A & B focus radiation from a cold body C to a warmer body D [a thermometer], which causes a decrease in temperature of D below the starting ambient room temperature. 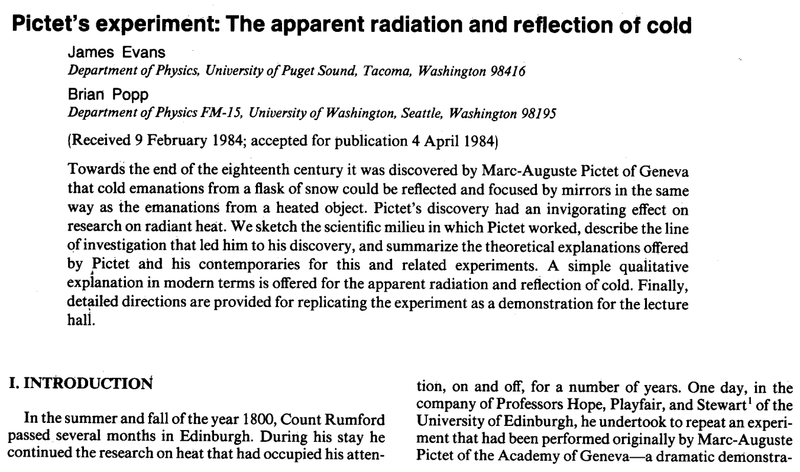 The really funny thing is that centuries ago Pictet conducted an experiment in radiation using polished concave metal mirrors. 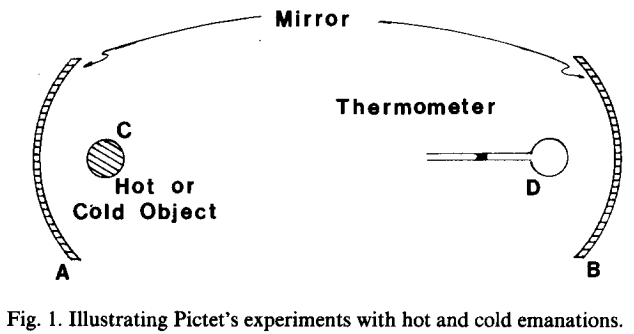 Each mirror was placed far enough from each other such that conduction/convection played little part in the experiment. He initially placed a hot object at one focus and a thermoscope at the other focus. The thermoscope indicated a temperature increase due to IR. He allowed for equilibrium with room temperature to reestablish. He then placed a cold object – a container of snow/ice at the focus and – viola - the thermoscope indicated a temperature decrease. He introduced a “new” energy source – the flask of snow/ice – emitting say 235 W/sqm at say minus 18 C so remote from the thermoscope that the low conductivity of air played no part in either the hot or cold energy transfer BUT he PROVED that cold does not heat hot – quite the reverse occurred. Modern physics explains this phenomenon by claiming the mirror screens the thermoscope from say up to 50% of the radiation from other objects in the room and the thermoscope is then radiating more to the flask than it gets back from the flask and hence decreases in temperature. This explanation sounds reasonable but fails to account for the fact that the air around the thermoscope was unable to maintain equilibrium with the thermoscope? BUT any way you care to spin this the radiation from a cold object always results in a decrease in temperature of a hotter object. This has been known for centuries until climate science invented their fantasies. Experimental data & paper proving this phenomenon. I think the crux is whether the colder object is warmer or colder than the ambient temperature. The ambient temperature for climate purposes being the temperature than the surface air would normally have at a given level of insolation. If the colder object is colder than ambient (such as a container of snow/ice) then it should indeed cool the hotter object faster than the ambient surroundings would have done. However, if the colder object is warmer than the ambient surroundings yet still colder than the hotter object then I would expect it to reduce the rate of cooling of the hotter object. The net effect of the presence of the cooler object is thus dependent on its temperature relative to the ambient temperature around both objects that would have applied in the absence of the colder object. It is a three way and not a two way relationship. I find that out in the real world where convection holds the balance between conduction and radiation it doesn't matter because convection always varies to negate any net thermal changes from variations in the three way relationship. A cool object cannot, in no uncertain terms, make a warmer object even warmer. If you believe it can, then PROVE IT! ... The statement I made here has been PROVEN repeatedly for over 200 years!!! Age old adage ... "You can't get something for nothing"
Yup amazing how so many fail to understand simple thermodynamics dating back two centuries. I think Squidly might have misunderstood my comment. A cooler object can in theory reduce the rate of cooling of a warmer object but only if the cooler object is warmer than the ambient surroundings for both objects and even then the effect is negated by convective changes which do the necessary work with or against gravity. Stephen, I am sorry, perhaps I did misunderstand you. This is why I like details and clarity of those details. For example, the currently accepted version of the so-called "greenhouse effect" (for which there have been no less than 6 hypothesis'"), as postulated by the IPCC and other climate conmen, is that the surface of the Earth is further heated by long-wave infrared "back-radiation" from so-called "greenhouse gasses". Supposedly, this "back-radiation" is capable of reheating (further increasing the thermal energy) of the surface of the Earth. The argument against this hypothesis is that this process would violate both the 1st and 2nd laws of thermodynamics, which it most certainly does. It makes no difference where the source of the original heat is coming from. ONLY the original heat (the Sun) is capable of heating the surface. The IR radiating FROM the surface cannot be hotter than the surface, and therefore, the "back-radiation" coming from the atmosphere and the so-called "greenhouse gasses" CANNOT be hotter than the surface to begin with. Therefore, the "back-radiation" is not capable of reheating the surface again. Now, can the so-called "greenhouse gasses" slow the cooling of the surface? Perhaps they can, however, even that has failed to be successfully reproduced by experimentation. For example, it is observed and noted, in REAL greenhouses, the addition of CO2 begins to DECREASE the temperature, NOT INCREASE IT! And this is within an enclosed space. I find it difficult to believe that in an open space one would experience additional heating as convection (the most prominent cooling mechanism within the troposphere) would work against this. The only reason why H2O acts as magically as it does, is that it is capable of "retaining" latent heat, which only serves to moderate temperature changes, both positive and negative. In short, there simply is no way that an object, regardless of where it is getting its heat from, can in turn act to further heat itself. It simply cannot be done, for if it could, there are all sorts of ways we could take advantage of this perpetuum mobile. But alas, if this were true, our universe could not exist, as these types of runaway processes would have never allowed our universe to cool in the first place. That's interesting about CO2 added to greenhouses decreasing temperature. Do you have a link for that. MS, thank you for the link. I will try to find for you where I was reading about the greenhouse. I really should have saved it when I came across it. I don't know how hard it will be to find it again, but it was only a week or so ago when I had stumbled across it somewhere. The gist of it was, some experiments were being done with greenhouses in a controlled environment. I believe they were carrying these out for about 30 years, a least they were recording data for about that long. One of the unexpected things they found was the degrees in temperature when they pumped up the CO2. As I recall, it wasn't a very large decrease, but enough to measure and was repeatable. Cheers! .. and I will do my best to find the writing about the greenhouses for you .. may take me a day or so, but I'll get back to you. Ok, lets's clarify a bit. GHGs added to an atmosphere will radiate to space from within the atmosphere. That is not possible without them. If radiation occurs from within an atmosphere it must follow that less energy is returned to the surface in adiabatic descent than is removed from the surface in adiabatic ascent. The term 'adiabatic' refers to work done against or with gravity and so by definition any work done with or against surrounding molecules is excluded. Now,, if less energy is going back down than is taken up that should cool the surface should it not? But the same GHGs are radiating down as well so the downward radiation being the same as the upward radiation (which should cool the surface) warms the surface to an equal and opposite extent. The reality is that the DWIR does not warm the surface as proposed by AGW theory. Instead it merely replaces the energy difference between the ascent and the descent for a net zero effect on surface temperature. Such DWIR cannot warm the warm surface beyond that permitted by the existing level of insolation. However, it can offset the effect of reduced energy coming back to the surface in adiabatic descent. Otherwise the surface temperature enhancement arising from the density of atmospheric mass would be dissipated as a result of radiation to space from within the atmosphere but that does not happen. If DWIR did not make up the surface energy shortfall then in theory an atmosphere of 100% radiative efficiency would entirely cancel the thermal effect of mass density but in fact such an atmosphere would still have a warmed surface beneath it. Actually, one can achieve the required effect without invoking DWIR. Radiation to space from within the atmosphere by GHGs represents leakage from the adiabatic cycle such that less energy is returned on the descent than is taken up in the ascent. The consequence is that the atmosphere rises less high which means that surface density will remain higher. Surface density determines the proportion of surface insolation that is taken up by conduction so all one needs is a slightly denser atmosphere at the surface to allow more conduction and thereby maintain surface temperature despite radiative loss to space from GHGs in the atmosphere. That fits with my general proposition better than the DWIR idea because I have previously argued that radiation to space from within the atmosphere leads to less radiation to space from the surface. Increasing conduction at the surface reduces surface radiation to space as required. @Squidly, So what becomes of the lower energy photons being returned from the atmostphere... Where do they go... Where do they end up... Do they pass through the earth and move out the other side. The LW radiation coming back is still energy... It must be conserved. Where does it go? Answer that question and you have a complete argument. I'll be sure to through out all of my blankets and only buy electric blankets from now on! Since you & others think blankets work by radiative forcing, here's a simple experiment. Try lying on top of your blanket instead vs. below it. I'm sure the radiative forcing will keep you just as toasty either way. There are, however, blankets which do warm things by impeding outward radiation, and they are used every minute of every day. In the GHG paradigm, it is never the GHG producing heat to warm the surface, it is always the Sun. Its input energy is simply impeded from escaping to cold space by the GHG, and so a small amount of heat energy 'pools' behind the GHG barrier, until the surface temperature rises to increase the outflow to equilibrium level. There is no 2nd Law violation. Increasing CO2 fails to heat the surface because of the negative feedback of water vapor, and other reactive effects, not because of a fundamental error in the basic GHE. Reducing heat loss is absolutely not the same as warming! COOLING is still taking place, albeit at a slower rate. Question is simple ... Is the blanket "making" warm or is it "keeping" you warm? I cannot believe the incredibly stupid crap I keep hearing about blankets. Incredible. If I wrap a blanket around the banana sitting on my kitchen counter, is it going to get warmer? Sheesh people (some), this is far from being rocket science. MS, I don't know how you put up with some of these idiots. And FYI, Tony Heller has gone completely off the rails. What a freaking idiot he is.... just WOW! Tony seems to be having a "Cognitive dissonance moment". His data analysis skills are telling him that there is NO evidence of a radiative GHE (he started this whole thing a few months back asking; "Is the GHE real? "), but he has heard so many times that is it REAL that he can't believe his own eye's. So now he has to trash any alternative explanations to make him self more secure knowing that he is correct and everybody else is the idiot. So he is defending the thing he holds most dear. With ridiculous simplified examples. His latest is that there "Must be a constant heat flow" and the materials in the system must behave to enforce this "constant heat flow". Where the heck does that come from ? What constant heat flow, crap it's cold as heck here, ain't much heat flowing around, is that the materials (same stuff that's here in the summer) forcing the heat flow, or is there just less sunshine here in the winter. It is engineering that attempts to create a constant heat flow (nice cozy dry/cool interiors for your house), not nature. "Subsequently, quantum theory also explained why a lower temperature/frequency/energy body cannot increase the temperature of a higher temperature/frequency/energy body, because all of the higher frequency quantum microstates of the hotter body are already filled and cannot be raised higher by lower energy photons from the lower temperature/frequency/energy body"
So where do the low energy photons ultimately end up? They fly off into dark sky where most of them never ever interact with anything because expansion of the Universe moves anything they could interact away and away faster than speed of light relative to their current location.